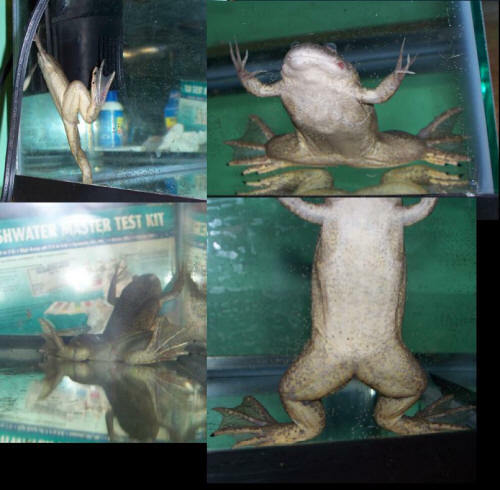 Hello, my question is concerning my two African clawed frogs. One is a male who is 4 or 5 years old, the other a female who is about 3 years old. They live in a 20 gallon long tank. They have Whisper internal filter 20 to 30 gallons, a heater and a cave. No bottom substrate at all. Fungus Clear, which is what the guy at my local pet store said would work. 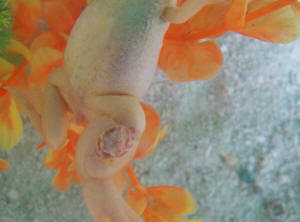 <Salt is sometimes used with Xenopus to reduce swelling, and sometimes alongside the appropriate medications. But in this instance, it doesn't sound as if your frogs have fungus. Fungal infections are very distinctive: white, fluffy patches on the body. The standard treatment is Mardel MarOxy. He also said to treat them both as the male would likely get it too. After two weeks of treating, water changes and the female going crazy and jumping out when I opened the lid, she seemed to be better. (I learned to not open the lid unless she was in her cave). No more red anywhere on her body, but she still wasn't swimming too great. So I continued the treatment for 3 more days. her swimming wasn't getting any better, nor was it getting any worse. She was still eating fine. All levels of ammonia, nitrite, nitrate, PH were good. I started the treatment again last night. 1 tablespoons of aquarium salt per 3 gallons of water, 2 tablets Fungus Clear and a water change every 3 days. No carbon in the filter so I'm not feeding them as much because I don't want the ammonia to spike. There is no ammonia as of midnight last night. PH, Nitrite, Nitrate and all that good stuff is perfect. I have been treating them again for 3 days and the male doesn't seem to be getting any better. Not worse and it isn't spreading, but not better. Do you have any suggestions at all that could possibly help? The treatment only seems to be keeping the infections at bay, not getting rid of them. Any other medications I could try? Thank you for your quick reply. I don't know what was up with the male, but before I got to treat him he shed his skin and the sore was gone. hasn't eaten in three weeks. I treated her with Maracyn TC everyday for two weeks, but she didn't get any better. I isolated her this morning in her own ten gallon with a filter. I noticed her legs were twitching. This only lasted a few seconds immediately after I put her in the tank and then she stopped and hasn't done it since. I noticed she has had a little trouble reaching the surface. Her legs look fine. I have attached some pictures of her. She doesn't appear to be in pain, but since she is a frog I guess it is kind of hard to tell if she is or not. Are there any stronger antibiotics I can give her? I am willing to try to get some antibiotics down her throat if it would help her. What about medicated foods? Here is a video of her swimming, maybe it will help. I have a single ACF in a large aquarium, which has a few live plants, fine sand on the floor and plenty of fish (including silver dollars, catfish, Pleco, Corys, mollies) and is generally a healthy tank. I've had the frog for nearly a year and have never had any problems with him/her. The other day I noticed that she had what appeared to be a small hole in her bottom lip and a few days later it seemed to have got a little bigger. On closer inspection it doesn't appear to be a hole but is definitely a lesion of some kind and was looking rather red and sore. Upon checking her this morning she now appears to have two lumps further down her throat, about the size of a match head each, that look like some kind of spot or wart. She also doesn't seem to be as active and just sits in the corner of the tank. I fed her two days ago (before the lumps appeared but while she had the sores) and she seemed to be eating fine - I don't feed bloodworm but do feed frozen krill, octopus and Tubifex. Have you any idea what this could be and how I could treat it? 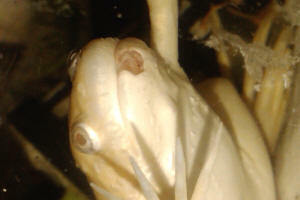 Tropical frog problem Hi i have an albino frog, looking at your picture i think its an albino clawed frog but not sure. I have had him along with 3 others for about 2 months and he has been doing fine. When i woke up this morning and looked at him, he has bloated up. As if someone has blown him up with air, right down to his legs. I thought that if it was over feeding then by night time he would of gone down slightly, but no sign of getting better. My local pet store couldn't really offer any advice, so i was wondering if you could. So please help quickly as i don't know if he will last much longer. Thanks for help < If your frog is still eating then I would watch him for awhile and see if the bloat goes away. Being that it happened overnight I am wondering if it shed and ate its shed skin. If it is an internal bacterial infection then there is little we can offer except that you might have to consult a vet.-Chuck> Phil. Frog Eyes My African clawed frogs have grown feathery things from their eyes. <It may be the frog shedding some skin, or it could be a fungus. Fungus usually occur in dirty tanks or to injured body parts. 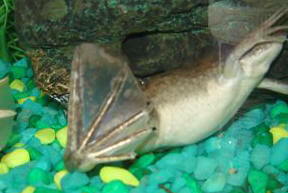 Fungal medications for fish may be worse for the frogs than the fungus. Try treating with aquarium salt at a tablespoon per 3-5 gallons. Frogs do not like a lot of salt. At these levels, the frogs will not be harmed but perhaps the fungus will clear. Make sure his tank is clean and had fresh water. Don> I put 6 feeder fish in with them yesterday and only one has been eaten. Usually 3 are gone the first day. They are hanging out at the top more than usual and not very active.